Bryan Harsin closed out the 2014 season by hoisting the Fiesta Bowl trophy for the third time during Boise State’s remarkable rise. That was far from the most important moment of Harsin’s first season in charge of the Broncos. For the head coach, the apex came nearly three months earlier after his team was handed an embarrassing beating by Air Force and the Broncos bounced back. Boise State went on to win its final nine games after that loss, capped by its victory over Arizona in the Fiesta Bowl. It set the stage for what could be a special 2015 season. There are questions to answer – namely how to replace do-everything running back Jay Ajayi – but should Boise State navigate a difficult first month of the season, it could once again be back in the national conversation. The Broncos are again the favorites in the Mountain West. They have defensive stars in safety Darian Thompson and linebacker Tanner Vallejo, and a powerful defensive front. Their offensive line returns all five starters, led by Marcus Henry and Rees Odhiambo. Do they have a chance to be part of the College Football Playoff? Maybe. Maybe not. The first seven games – beginning with an emotional reunion with Chris Petersen as Washington visits the blue turf – will be significant. If there is one big question for the Broncos, it’s who will step in to replace Grant Hedrick at quarterback. Sophomore Ryan Finley exited spring practice as the clear leader, but an April misdemeanor arrest clouded his status. Harsin said Finley is eligible and won’t face further discipline for his arrest. Finley is the leader, although the Broncos have other options in Tommy Stuart, Alex Ogle and freshman Brett Rypien. It’ll be nearly impossible to match Ajayi’s production last season. Ajayi finished with 1,823 yards rushing and 28 touchdowns, plus 50 receptions and another four touchdowns through the air. Replacing him won’t be a one-man job. The Broncos will rely on a stable of backs including brothers Cory and Kelsey Young, the latter a transfer from Stanford, where he averaged 6.4 yards per carry during his three seasons. Because of injuries, Vallejo played all over the Broncos defense last season, starting games at both nickel back and middle linebacker, and capped his season by becoming the defensive MVP of the Fiesta Bowl. That versatility is a benefit for the Broncos defense. But they’re also ready to see how impactful he can be in one specific spot – linebacker. “Tanner was a guy last year, we put him where he was going to be the most effective for our football team and he did exactly that. I couldn’t say more about a player being unselfish in doing those things and being productive at the same time,” Harsin said. Boise State has produced a line of quality defensive backs that have gone on to solid NFL careers. Thompson could be the next. The 6-foot-2, 210-pound senior anchors a defensive backfield that is filled with upperclassmen and had 18 combined interceptions last season. Thompson grabbed seven of those picks. Take away the Broncos’ emotional reunion with Petersen when Washington becomes the fourth Pac-12 school to visit the blue turf and it’s still a difficult first half for Boise State. After the opener, the Broncos travel to BYU. After a brief respite against Idaho State, the Broncos play three of the next four on the road at Virginia, at Colorado State and perhaps their most difficult MWC game, at Utah State. 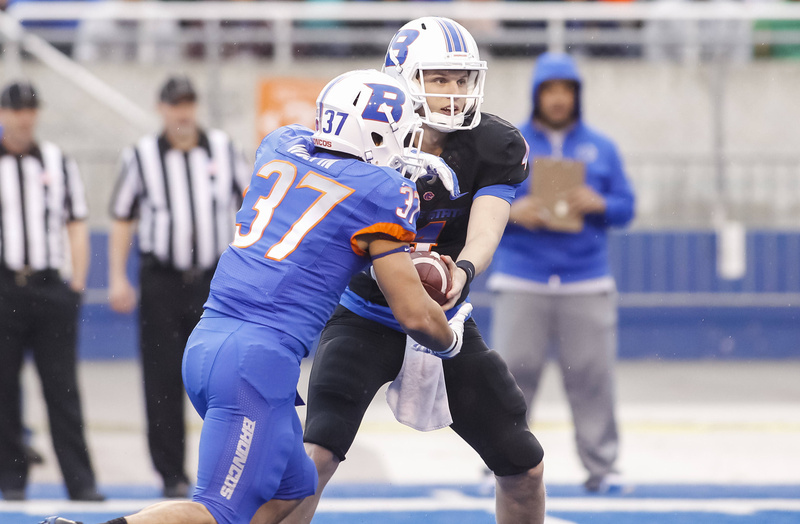 Get through the first seven games unscathed and it could be another special season in Boise.